Gazpacho isn't the only cold soup out there. Place butter, honey, ginger root and lemon peel in a small bowl. Microwave until butter is fully melted, about 45 seconds. Use a rubber spatula to scrape mixture into a food processor or blender. 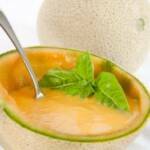 Add melon chunks and puree until as smooth as possible. Transfer to a bowl, cover, and chill thoroughly (4 or more hours). Don't eat it all because you can use some to make cantaloupe cupcakes - recipe coming soon!